It seemed a straightforward choice of a relatively young, academically outstanding and politically seasoned lawyer who shared Richard Nixon's philosophy of 'strict constructionism.' As Nixon's White House Counsel John Dean reveals for the first time that the choice was anything but straightforward. The truth is that Nixon's nomination was the result of a dramatic, Nixonian rollercoaster. Rehnquist was a last-minute longshot who had once been dismissed by Nixon as a 'clown.' Only John Dean -- Rehnquist's champion at the time -- knows the full, improbable story. 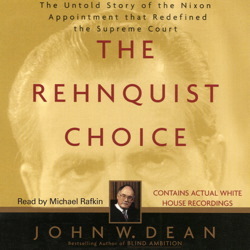 The Rehnquist Choice fills in a long-missing explanation of the making of the man who wrote the majority opinion in Bush v. Gore and presided over the impeachment trial of William Jefferson Clinton.